Dentures (in some form or fashion) have been utilized to restore lost teeth for hundreds of years now, and today, many patients still prefer them for their reliability and economical value. At Dental Health Centers, our doctors and specialists offer both full and partial dentures for patients who are struggling with a severely lacking smile. Like the name suggests, full dentures are used to replace an entire arch of missing teeth, while partial dentures can fill certain spaces while leaving healthy teeth intact and unable to shift. Above all else, our team’s goal is to create results for our patients that they feel satisfied and comfortable with. Contact us today to schedule an appointment at any of our three locations in Pembroke Pines, Miami Lakes or Coral Gables. To replace several or even all of a patient’s lost teeth. To enhance the patient’s smile and support their facial tissues, preventing gradual deterioration. To improve their speech, their diet, and their chewing strength. 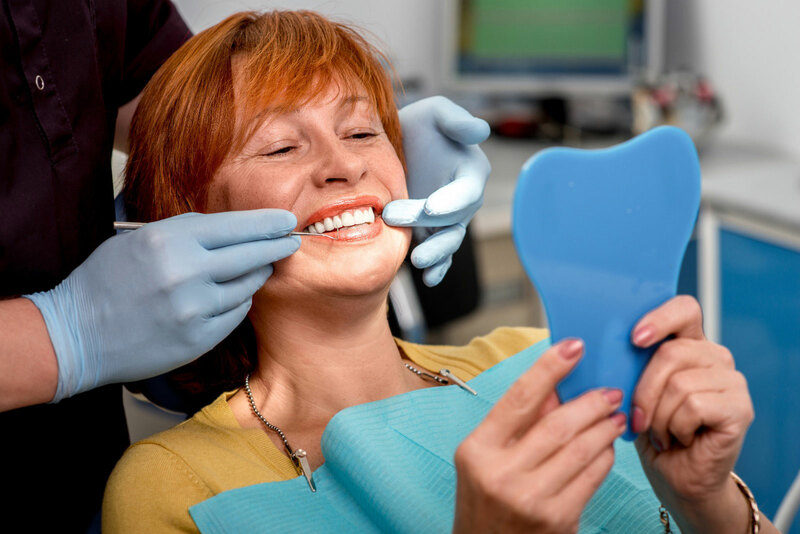 Receiving a quality-made, personalized denture will require a few appointments. Our doctors will take very detailed impressions and measurements of your unique smile to ensure the ideal fit, and a “try-in” appointment will help us determine that the color of the denture, its shape, and its color is all correct. Once we have the finished denture, we’ll make any necessary last-minute adjustments so that it feels fully comfortable and functional within the mouth. Our team will also instruct you concerning how to properly clean and store your new denture, which will help you maximize its lifespan. Dentures can be either “final” or “immediate” in nature. The final model is crafted after the patient’s failing teeth have already been removed and the gum tissue has properly healed, which can require up to 16 weeks. In order to keep patients from having to endure such a significant period of time without dental support, an immediate denture can be crafted before the extraction occurs for instant placement. After the patient has recovered from the procedure, the immediate denture will no longer fit properly and a final version will need to be created.